Posted 5/30/2017 11:30am by Village Acres CSA. We are happy to bring you the first share of the season today. We were fortunate to find enough ripe strawberries in the field to give you all a small taste of them this first week. The cucumbers are also making an early appearance. These crisp treats are coming from our field tunnel, which we can use to advance the season by a few weeks. See below for details of the other share contents this week. Egg Shares: If you signed up for an every other week egg share, you can start by picking up eggs today and every "Odd"week throughout the season. Since this is Week 1 of 25, it is an "odd" week. Throughout the season if you can't remember if you get eggs on a certain week, look at the top of the checklist to find the week# and if odd, it's your week for eggs! Scroll down for more details on pick-up locations and directions for each site. Outstanding Balances: If you have a remaining balance for this coming season's shares, you should have received a reminder email last week. We ask for payment in full by the first distribution if at all possible, but are willing to arrange payment plans if this is not feasible. Payments can be made online by following the link included in the reminder email or can be brought to distribution. Please email or talk with us if you would like to arrange for a payment plan. Please let us know if you have unanswered questions! Deb's cell phone number is 717-348-4916 or send us an email at csa@villageacresfarm.com. Your main vegetable share will be in the white Sprinter Van and the sales table and any choices will be on the tables in the grassy area. In case of poor weather, we may move inside (but boxes will still be in the van). When you get to the Friends Meeting, start at the back of the van – one of us will be there eager to help get you orientated to the pick-up process. We will have a checklist to confirm we have you down for the correct share items and will guide you through the pickup routine. Egg Shares are typically in crates stacked in a line close to the van. You'll get any other directions you may need from starting at the van. On-Farm Members: On-Farm Pickup is from 4:00 - 6:00 p.m. at the farm, in the FoodShed. Pull into the farm's driveway (red barn on your right, white house on your left). Distribution is set up in our FoodShed (wood sided building -Returning members please note this change!). Recipes: Did you know we have hundreds of recipes on our website and they can all be searched by ingredient? Simply visit www.VillageAcresFarm.com/recipe and search away. If you come across a recipe you particularly like, please send it and we’ll add it. Join us for our 20th Summer CSA season! Posted 2/13/2017 11:06am by Debra Brubaker . We’re excited to announce that registration is now open for our 2017 Summer/Fall CSA Season. This year will mark our 20th year sharing the bounty of our farm with our community through a Community Supported agriculture program. I remember packing shares for our 19 CSA members back in the summer of 1998- excited about this new idea that my older sister Angie had introduced to our family and had returned to the farm to implement. The satisfaction of packing those shares- the beauty of the diversity of a week’s harvest all in one box, and the opportunity to hand that box to a customer we had a relationship with every week was so exciting to me as a 16 year old. Nineteen years later, our family is still realizing that satisfaction the CSA brings us in our daily work of tending this land and the value of the relationships with our CSA members in the sustainability of our farm. We are eager to embark on a new season- our onions seeds are sprouting with many seeds to follow so it’s time to make sure we know who will be ready to share in all this season has to offer! For a breakdown of the season's offerings please follow the link below. We would love you have you join us for this milestone season. 2017 Summer/Fall Season: 25 Weekly distributions: SIGN UP NOW OPEN! Today is Distribution Day- Week 25! Posted 11/1/2016 11:50am by Debra Brubaker . Just a quick reminder to come and pick up your share- this is the 3rd to last share of our regular Summer/Fall Season (which ends the week before Thanksgiving. It's an ODD Week for egg share folks. Please remember to return share liners and (paper) egg cartons. We are especially short on the plastic liners, and we really do like to re-use them as many times as possible. If your liners are intact, please be sure to return them to us! We also reuse pint and quart jars (used for honey). The season is winding down- only 3 weeks remain in our Summer/Fall Season! While much work remains for our current seasons, we are already starting on some tasks on our "winter projects" list. On the top of this list is creating a "new" propagation greenhouse space for the coming year. Our current propagation greenhouse was built well over 20 years ago and has been stretched in every possible way to support our needs as our farm grew from small farm selling primarily from a road side stand to what it is today. While I love many aspects of this greenhouse which show my parents thriftiness and ingenuity, it is time to create a space that better meets our needs. We are not looking to expand production, but we would like to have a better space that contributes to better health and vigor of transplants that head to our field at the same time as making our work easier in the spring. Our plan is to convert our oldest greenhouse (built in 2001 when our winter share was added for the first time) to our new propagation greenhouse. This week we started the process by taring out the old wood used to create raised beds, and stretching new plastic over the greenhouse. In the coming weeks we will build benches, figure out heating, and making sure all is set to go for February when we start our growing season all over again. Fall/Winter/Spring CSA signup and Thanksgiving Turkey preorder: We are taking reservations for winter share options and Thanksgiving turkeys! If you plan to sign up for both, visit our one stop sign-up shop. If you only want to reserved your turkey, you can do so here. Please don't delay, as both winter shares and turkeys often sell out for us. We have lots of turkeys left for sale, so if you have friends and neighbors that may be interested, please direct them to our website! Today is Distribution Day- Week 24! Posted 10/25/2016 2:11pm by Debra Brubaker . Just a quick reminder to come and pick up your share. This is an Even week for egg pick-up. Please remember to return share liners and (paper) egg cartons. We are especially short on the plastic liners, and we really do like to re-use them as many times as possible. If your liners are intact, please be sure to return them to us! We also reuse pint and quart jars (used for honey). IN THE SHARE THIS WEEK: Lettuce Heads, Salad Mix, Spinach (Full share only), Broccoli (Medium Share only), Swiss Chard, Red Beets, Watermelon Radish, Sweet Potatoes*, Fingerling Potatoes, Peppers, and Roma Tomatoes. *The Sweet Potatoes this week are from Windy Knolls Farm (a fellow member of Tuscarora Organic Growers). Our sweet potato harvest was not real strong this year and we quickly realized that we really could use more for our fall/winter needs. Luckily our friends at Windy Knolls farm planted too many because, as they say, "no one was there to stop them." We helped them with their surplus so some of the sweet potatoes this year will be coming from their farm, which is also certified organic. The official freeze warning has been issued for our area tonight- it's been a long time coming. It's always sad to see blackened tomato plants, but it is nicely balanced by the sight of dead galinsoga- the pestiest weed which has likely graced your lettuce or salad mix from time to time (don't worry it is technically edible). We continue to fill the coolers with roots this week- red beets, carrots, and parsnips this week. Tomorrow we have the exciting task of putting new plastic on one of our greenhouses. Please send wishes for calm to the weather gods, as we really hope to not feel like we are a bunch of farmers all hanging on to a giant kite! Fall/Winter/Spring CSA signup and Thanksgiving Turkey preorder: We are taking reservation for winter share options and Thanksgiving turkeys! If you plan to sign up for both, visit our one stop sign-up shop. If you only want to reserved your turkey, you can do so here. Please don't delay, as both winter shares and turkeys often sell out for us. Posted 10/18/2016 11:54am by Debra Brubaker . Just a quick reminder to come and pick up your share. This is an Odd week for egg pick-up. Please remember to return share liners and (paper) egg cartons. We are especially short on the plastic liners, and we really do like to re-use them as many times as possible. If your liners are intact, please be sure to return them to us! We also reuse pint and quart jars (used for honey). 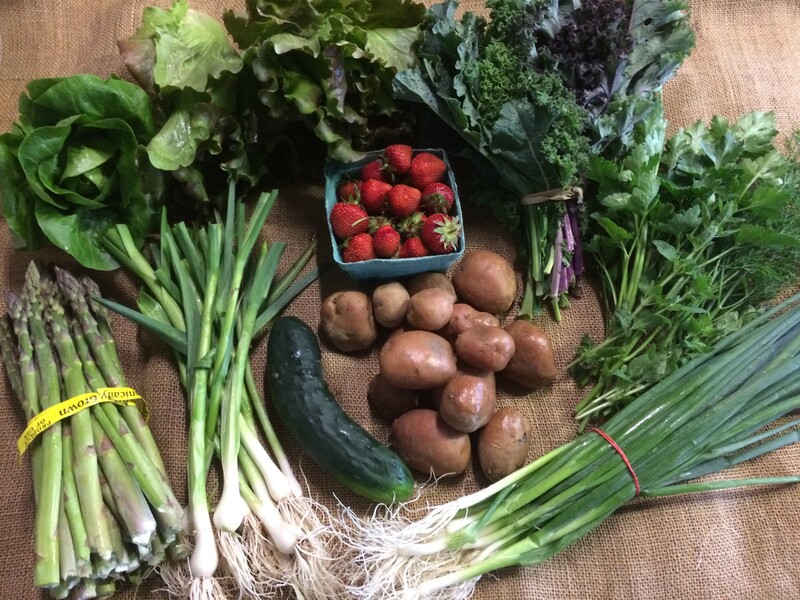 IN THE SHARE THIS WEEK: Kale, Bok Choy, Salad Mix, Ginger, Garlic, Onions, Delicata Squash, Peppers, Tomatoes. 2016 Fall Carrots: We plant our carrots 3 row on a raised bed. When harvesting we hand dig one of the 3 rows, and once the one row is out, we have an implement that attaches to the tractor the can quickly undercut the remaining two rows (it's just a little too narrow to do all three beds without damaging some carrots). Once undercut the carrots are very easy to pull up in clumps as done in the photo above. Greenhouse 16 (our big one): This summer, this greenhouse was filled with all types of peppers. Late last week, all the pepper plants were pulled and carried out. Early this week, compost was added and beds were reworked. We will begin seeding greens with plantings spaced a few days aparts over the next 2 weeks for successive harvest throughout the winter. The turmeric (on the right) will be harvested in a couple of weeks. Today is Distribution Day- Week 22! Posted 10/11/2016 11:00am by Debra Brubaker . IN THE SHARE THIS WEEK: green cabbage, chard, salad mix, sweet dumpling squash, celeriac, peppers, tomatoes, and carrots. We had just a light touch of frost overnight- while it did not harm any of our crops, it does mean that we really need to hustle to go the last of the temperature sensitive crops out of the fields. Luckily there is not much left- some celeriac as well as the last of the eggplant, peppers and tomatoes. We finished harvest sweet potatoes yesterday, and will have some in your shares as soon as they are cured. We are still waiting patiently for our Broccoli and Cauliflower to form heads. I see little ones coming, but they will still need a week or more. Luckily cold temperatures help to make these crops even sweeter, so we will wait patiently! Fall/Winter/Spring CSA signup and Thanksgiving Turkey preorder: We finally have our website set up to take reservation for winter share options and turkey preorders! If you plan to sign up for both, visit our one stop sign-up shop. If you only want to reserved your turkey, you can do so here. Please don't delay, as both winter shares and turkeys often sell out for us. Posted 10/10/2016 7:25pm by Hannah Smith-Brubaker. The seasons are turning and time has come to spread the word regarding turkeys and our CSA offerings for Late Fall/Winter/Spring. If you have questions please don't hesitate to contact us. We raise primarily Broad Breasted Whites and Broad Breasted Bronze turkeys. Our turkeys are raised on our farm from day old chicks. From the time they are feathered, they are raised on pasture with ample space for grazing, roaming, and foraging for insects. They are supplemented with non-GMO grain. Preordered Turkeys will be available fresh the week of Thanksgiving. Weights are variable (15-24 lbs). We try our best to match your request as closely as possible, but as with all things in nature...there will be variability. Reserve your turkey at the same time as signing up for our winter CSA (follow links below) or you can Order now! Thanksgiving week and December 2017 Share options: Sign up now open! We know that the holidays are both a time of great feasting and frequent travel, so in an effort to accommodate CSA members' holiday plans and schedules we thought we would let folks sign up for shares on only the weeks that fit best with your schedule. We will deliver the week of Thanksgiving and then every other week until Christmas. Please also note that if you are a current Summer/Fall CSA member you may have already selected and paid to receive a share the week of Thanksgiving. So, if you don't remember if you have, please check with us before signing up again for Thanksgiving week! 2017 Winter/Spring Season: Every other week from the end of January (Early Feb for Friday Pickups) through the end of April: SIGN UP NOW OPEN! The full produce share includes both a "greens share" and a selection of storage crops with each delivery. This is a great option for folks who can make use of a wide variety of produce and who may otherwise find it difficult to remember to preorder produce every week. The greens only share will include a variety of leafy greens grown in our high tunnels during the winter months. These greens will include salad mixes, kale, chard, spinach, and other asian greens. Get your dose of freshness with this share option. Our Egg Share come from our own Pasture Raised hens. These hens are on pasture year round (with access to shelter as desired). Their diet consists of non-GMO feed, clover, grass, grubs and insects, and select discarded produce throughout the season. Choose to receive 1 or more dozen with each delivery. Are you interested in getting winter storage crops but would like to pick and choose what you want with each delivery? If so, you can select to buy our root and storage crops a la carte this season. With this option you will need to preorder items through our website in advance of each delivery. You can choose to pay at the time of pickup, or if you would like to purchase a credit to deduct from over the winter months, you may do so through the sign up process. Please note that we do not promise to have greens as an option for a la carte purchasing in the coldest months of winter. Sign up for Fall/Winter/Spring Season! Thank you. We are honored that you have chosen us to be your farmers! Today is Distribution Day- Week 21! Posted 10/4/2016 11:26am by Debra Brubaker . The fall frenzy is starting- each day we are torn between the two main priorities, harvesting the remaining crops in the field and getting the greenhouses cleaned out and seeded into winter greens. The rainy days of the last week have given us some good greenhouse time and we will start seeding and transplanting today. As soon as the ground dries out a little we hope to start our fall carrot harvest- my all time favorite farm task! Also on the list for this week harvest butternut squash,cabbage, and celeriac. After those, the sweet potatoes are next, followed by more beets, turnips, watermelon radishes, and parsnips. We also have plantings of broccoli and cauliflower that should be forming heads in the near future (don't worry Medium share folks-we have not forgot your broccoli). I have not been sitting at my computer much this summer, but in the next week, hope to set up our website for taking signups for our December Share options, Winter Share (January-April) and thanksgiving Turkey preorders, so please stay tuned! Posted 8/30/2016 1:22pm by Debra Brubaker . IN THE SHARE THIS WEEK: Sungolds, Celery, Yellow Onions, Garlic, Chard, Beets, Tomatoes, Bell Peppers, Summer Squash, Hot Peppers. What a start to the week! Yesterday morning we received word that the grandmother of 3 of our works passed away so they would be spending the day with family, and at the same time our employee Kat started having contractions. To further add to the excitement, Hannah's father who has been in and out of the hospital, and is currently living with us, had to return to the emergency room midday yesterday. So today's share is brought to you by fewer hands workings as quickly as possible. Some of the frills we had hoped for are missing, but we promise to add those next week. We have celery again this week. My mother has been making use of all the seconds we have by sauting chopped celery with onions and mushrooms and freezing the mixture in small portion to add to soup throuhout the winter. I have also been adding this mixture to my morning eggs which has been delicious.